I approach the garage cautiously. I know a family used to own this place, back before the war, but there's been rumors they're gone. Or maybe not gone, but dead. "That would be perfect," I think to myself, and then I feel bad for thinking it. "Perfect that someone's dead? How messed up is that?" I shake my head. No time to think about it. I approach the front door as stealthily as I can. "Hello? Who's there?" says a voice from inside the garage. I start to bolt for the exit, but I hear the man call after me. "If you have medicine, I'd be so grateful! Please, my father is sick. He needs medicine. We can help you in return." I pause. He's just another civilian—not dangerous. And by the sound of it, he has valuable supplies to potentially trade to us. We have medicine back at the base, but I'm loathe to part with it. We've already had multiple people take sick since the war broke out. That medicine is worth more than...well, worth more than a man's life. "Sorry, man" I say out loud. I shoot him. 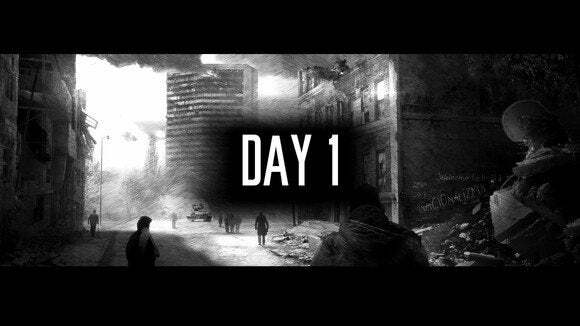 This War of Mine gives you about a dozen days to retain your soul. There's a war going on and you control a group of civilians stranded in the middle of it, the city crumbling around you. All you have to do is survive until it's over. The game is split into a day/night cycle. "Days" are spent playing what amounts to a post-apocalyptic version of The Sims. You're shown a side view of your entire base, which is full of random supply caches to loot and debris to clear when you stumble upon it on Day 1—a valuable start to your survival effort. Supplies are then used to craft other, more advanced items, many of which are placed around your base. Wood, for instance, can be converted into boards for the windows, into beds, into fuel for a stove, into a rain-catcher, into a workbench, into an animal trap, et cetera. Items range from utilitarian—the aforementioned stove, for instance—to morale-boosters like a guitar or a comfortable armchair. As you can imagine, with that many things to craft you're quickly going to burn through (maybe literally) the supplies in your own base. At night you assign your characters to different roles. Sleep is necessary, but rare. You'll have to cycle people on and off sleep each night, with those remaining awake fulfilling guard or looting duties. The latter makes up the second half of the game. Each night you'll have the opportunity to send a single character out into the city to loot derelict buildings or not-so-derelict buildings. 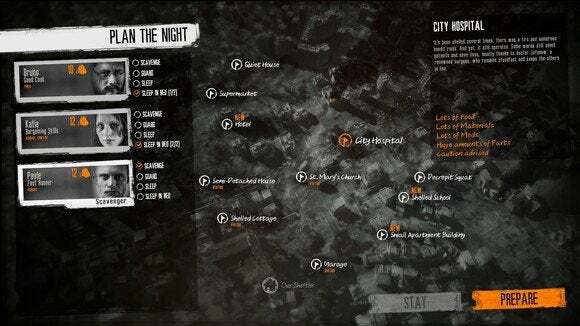 You can only hit one location every night, and once you've picked over a place those items are gone forever. Not only that, but over time locations will gradually lose their items to simulate other people looting those locations. A dozen days to keep your soul. Those first dozen days or so are full of enough empty locations you can mostly make your way in the world. You can loot an abandoned house here, steal from a front step there, and generally avoid coming into contact with other survivors. Everything stays relatively quiet on the home front too—when you return every night the game tells you whether anything happened while you were away. For a while you'll get the luxury of letting all your unused characters sleep, returning to find that peace lasted throughout the night. The game opens more and more city locations each night though, and eventually you reach a point where all the empty areas are stripped bare of valuables and you're forced into contact with others on a regular basis. It's at that point This War of Mine gets uncomfortable. Because see, you could go infiltrate that military base for supplies, contending with an entire army of well-trained men with advanced weaponry. Or you could kill the poor guy in the garage and take all his stuff without fearing for your life. I've had the luxury of growing up in the United States, and despite the fact we've been at war for more than half my life things have stayed pretty quiet at home. This War of Mine forces you to make choices I'm grateful I've never had to make in real life. This isn't Call of Duty or Battlefield or Medal of Honor. This isn't a story of heroics, or valiant sacrifice. It's a story about rats. It's a story about how far you'd go to survive. And it's easy to abstract it—to look at it as a game, with virtual people doing virtual things. 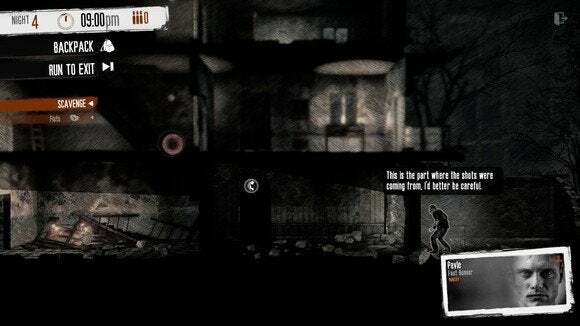 What makes This War of Mine particularly horrifying though is that it's not abstraction. Sure, the particulars may be fictional. Sure, it's an oversimplification of human relations. But there are people making these choices, being put through these situations, every damn day. That's a powerful message. 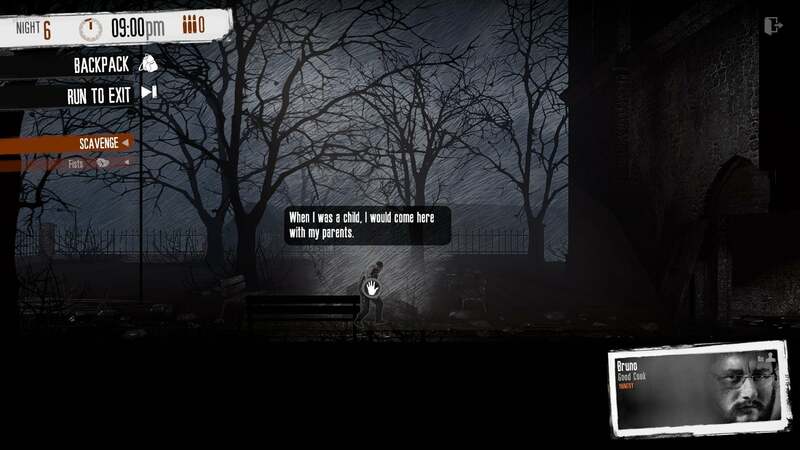 This War of Mine says more about the realities of war with its small-scale, side-scrolling interpretation than Call of Duty has said across bombastic sequel after bombastic sequel. 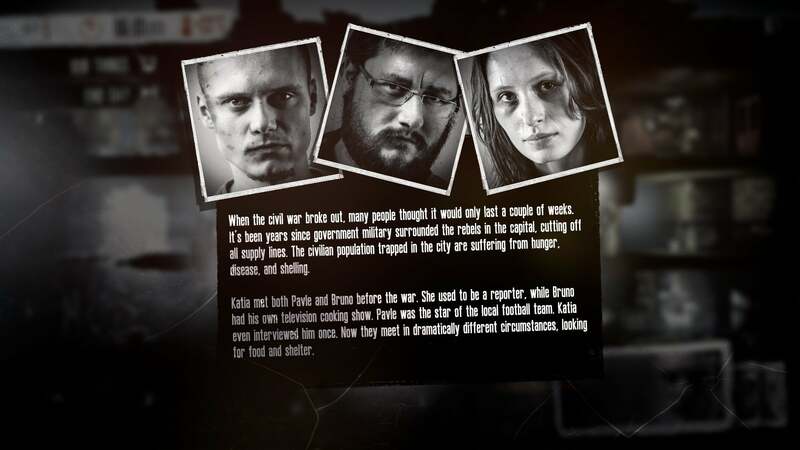 This War of Mine isn't perfect as a game. Towards the end of a run there's too much downtime—some of the systems are overly exploitable, and once you've got a routine set there's little reason to deviate. But like Papers Please, This War of Mine conveys some horrific truths about the world we live in, and it does so in a way that other mediums could never accomplish—by forcing you to live with the guilt of your own choices. This War of Mine conveys some horrific truths about civilian life during warfare, and it does so in a way that only video games can accomplish.